All strops are not created equal. As a matter of fact, I have heard countless times throughout my years in the wet shaving and barbering industry that a shaver’s strop is quite irrelevant, and “the cheaper the better”—a partial truth, to be sure, because who doesn’t like to get good quality products for good prices? In some cases, individuals will have gone out and found a quality vintage or used strop for a decent price, but with the recent explosion in wet shaving paraphernalia, this antique find is becoming harder and harder to acquire. Often times, someone coming into the wide and wonderful world of wet shaving or professional barbering will do a quick google search or stop by their local antique store only to be disappointed with cheap “pleather” products, or antique leather so dried out or heavily used that the tool would work better on display in a museum rather than in a washroom or on a barbering chair. Let it be known that a strop has the ability to either refresh your blade upon every pass, or roll the edge to a “perfect dull” with every pass. Therefore, I reiterate—all strops are not created equal. There are quite a few companies and artisans currently producing leather strops, many of which don’t have any experience professionally stropping an actual razor or even shaving with a straight razor, and this shows in the quality of their strop. No fault on the character or ethos of the company, they simply don’t know what is required of a strop that will last this lifetime, and maybe many more! 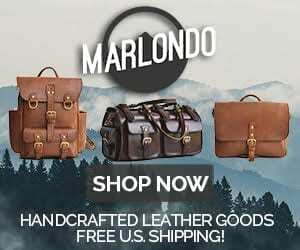 A few months ago, I was checking out at a leather strop used by many of the wet shaving enthusiasts, and I was sorely disappointed with the quality of the product compared to the price. I thought, “perhaps the golden era of wet shaving products is over?” Then something quite wonderful happened—I received a J. Ryan & Co. strop. Let me give you a little back story here. I run a small wet shaving site where I offer straight razor restorations and custom shaving brushes for those looking to get into artisan wet shaving products. I am also a consultant and marketing specialist for a large barber supply company which allows me to travel to barbershops all over the U.S., many of which ask me to hone their razors and teach them new techniques for blade maintenance and general straight edge practice. Over the past few years, I have honed and stropped thousands of razors of all various shapes, sizes, and quality. This means I have also used quite a few different strops. When the crew at BestLeather.org sent me the J. Ryan & Co. strop to review, I immediately knew that this strop was different than others—it wasn’t just a tool, it was clearly an artwork. I received the strop folded in a light-weight linen drawstring bag, and when loosened the twine, I was hit with that pungent, quality leather smell we have all grown to love so very, very much. At this point, I knew nothing of this product other than it came from a gentleman who makes strops. I knew nothing of the leather, nothing of the hardware, the width, length, etc…this was all a surprise for me, and boy was I surprised! Most leather strops on the market come in general width sizes with the most common sizes sitting somewhere between 1.5” to 2” wide. This particular strop I received boasts an impressive 3” width with an overall length of 30”, 17” of which is the proper stropping interval. When I pulled the strop out of the bag, I was immediately impressed with this behemoth’s overall size. The length and width are certainly not uncommon in the world of strops, but it does my heart well to see such a quality strop in this size. Now, when it comes to strops, the leather quality either makes or breaks the product. I have come across other strops that happened to be this size or even bigger, but each strop I have seen that can even be compared to its size lacks the leather quality necessary to be considered a viable straight edge tool. Quality leather is obviously not cheap, so crafters will often use cheaper leather in order to offset the cost of the strop’s length and width in order to keep the product within a certain price range. Not so with the crew at J. Ryan & Co. In fact, where most crafters will only use a single length of leather coupled with a single length of linen or cotton, the crafters at J. Ryan & Co. decided to use finest Horween leathers for all of it’s leather components. For those of you familiar with the different parts of a strop, you are already aware the purpose each side serves. For those of you wondering why one length of leather is not good enough, let me take a moment to elaborate a little on strop maintenance—in order to keep this as a brief introduction, lets refer to each side as the light side (secondary length) and the heavy side (main body). The light side of a strop serves two purposes. (1) to remove any burrs or rust on the edge of the blade in order to prepare the edge for a good “refreshing,” and (2) to warm the edge’s metal by means of friction in order to allow the heavy side to properly refreshen the blade. This obviously means that the heavy side is specifically for refreshing the blade in a quicker and more efficient amount of time than if you were to simply use the lighter side. Now that this is finished, lets get back to the review! The main body is crafted from Horsehide Chromexcel in what I am guessing is in 6-7 oz. leather, which certainly makes for an impressive main strop body given its heavy draw. The main body on the strop I received is beautifully dyed in rich burgundy, which only adds to the discerning character of this piece. Where other crafters utilize a length of linen or even cotton for the second part of the strop body, the crew at J. Ryan & Co. decided to trash the idea of cloth all together and dedicate this strop as a full leather product—something which resembles the quality strops of yesteryear, and quite a breath of fresh air for myself, if I might add. This lighter side utilizes Horween’s Snuffed Suede leather in what I am guessing is 4-5 oz. leather instead of a cloth substitute. A wise choice, in my opinion. It looks as though the suede side is dyed at the tannery in a stonewashed gray, something which compliments the burgundy wonderfully. Moving onto the rest of the strop, I am thoroughly impressed with the handles and hanging component J. Ryan & Co. included within this product. Lets start from the top and move down—first, the hanging component of the strop serves two purposes. (1) It attaches the hardware required to hang the strop, and (2) it binds both the light and heavy lengths together. This component feels like something you would find on a horse’s saddle—its rigid and unmovable! It feels and looks like leather, but its solid and sturdy like a hard material—a fantastic quality to have for this component! Because of it’s inherent purpose, this part of the strop usually always go out first. The constant wear on this “hinge” usually results in the strop falling apart from the top down, but I don’t see that happening with this component anytime soon. The handles of the strop are even more ridged and durable, as it is comprised of 3 layers of horsehide which have been bonded and stitched together. The handles are then hand beveled and rounded, then stained to match the rest of the strop and finished with beeswax for a high sheen. 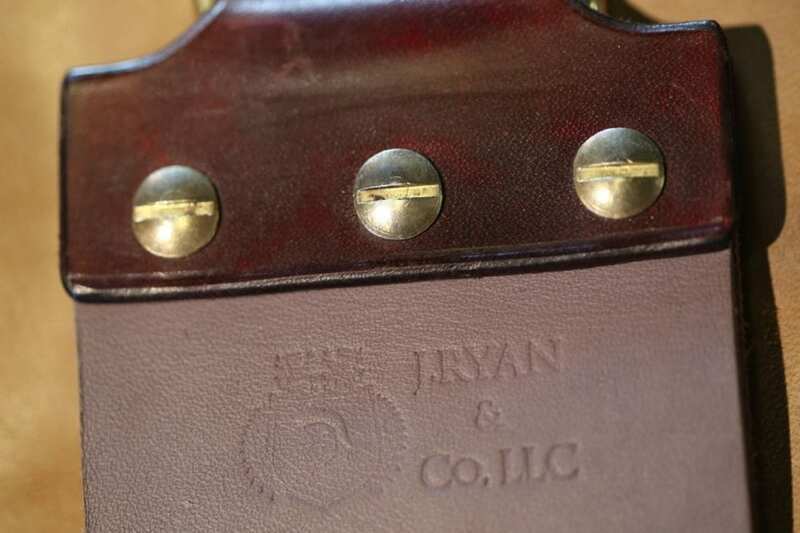 J. Ryan & Co. didn’t just stop with quality leather, they also ensured their product was adorned with quality hardware as well—solid brass. The hanging component is a solid brass bolt snap accompanied with a brass ring. This allows the shaver to comfortably use the hanging component with large hooks and small “clip on” surfaces alike. Should something catastrophic ever happen (dog chew toy, *cough* *cough*), take heart knowing that the lengths are bound together by solid brass Chicago Screws, so if you do need to change one length or another, you are able to do so with ease and more importantly, without having to purchase another strop. Lastly, I want to touch on what I think is one of the coolest parts of the strop—the logo. The stamp is deeply embossed in the leather handles and the strop lengths, which offers 4 opportunities to gander at this beautiful creation! Inspired by medieval artistry, the stamp exhibits a coat-of-arms and a bold font which scream “simplistic, yet exquisitely refined.” I recently returned home after a stint in Scotland, and the stamp artistry ushers me back to the castles I visited and the “old world feel” associated with 14th and 15th century Europe. No joke, when I look at this strop, it makes me want to go back to Scotland. There is certainly something to be said about that which invokes such emotions and memories. Now with the general information of the strop covered, let’s move on to my experience with it! When I received the strop, it was definitely new. So new in fact, that it was actually quite difficult to use the main body of the strop. This is of no fault to J. Ryan & Co., and really is not a fault at all. Good quality leather takes time to break in, especially with the main body sitting somewhere in the 6-7 oz. range! There are sturdy bags made with that kind of leather! It should be noted that the lighter side has been comfortable since day one, which once again is of no fault, rather the result of lighter leather. Before touching pen to paper with my thoughts on this strop, I wanted to spend at least a month with it. In one months time, I had the opportunity to use this strop every singe day, multiple times a day. I was able to strop somewhere around 50 razors with it, and used it for my personal razors every morning. Everyone has a specific way they like to strop, so I am not even going to touch on that theme here, but I will say that I stropped each razor approximately with 60 passes on the lighter length and 30 passes on the heavy length, so I have come to know this strop fairly well in such a short amount of time. I was not taught to use a stropping a blade on brand new Horsehide Chromexcel so that actually took a little getting use to. After a week, the leather finally started to break in and I was able to get an actual feel for what this strop was going to perform like. After two weeks, I actually got excited to use the strop, and at the end of the second week, I decided to perform a test. I took my favorite strop that I have been using for the last three years and compared it to the J. Ryan & Co. strop that I had been using for 2 weeks. I used the same razor, with the same number of passes, and conclude that the J. Ryan & Co. strop was more comfortable, and seemed to polish the edge of the razor so much better than my previous strop. I credit most of this to the lighter Horween Snuffed Suede leather length instead of a linen length, however, these can be no doubt the main body of the strop plays a huge (if not the primary) role in refreshing the edge. For those curious, I used a Wade & Butcher true-wedge for this test, but most often used a late 1890’s H.G. Long & Co. french tip in quarter-hollow—my every day straight edge. One unfortunate thing about strops is that no matter how gorgeously beautiful they happen to be, you will inevitably cut gouges and slivers out of the leather over time. When you are performing thousands of passes with an instrument so sharp it could cut hair just by lightly passing the edge over the center, it is inevitable that you will damage the leather. After the first week, I cut a sliver in the top of the main length and nearly cried out of disappointment. After another week, you can barely tell that there was a sliver cut in at all, and I imagine than after another month or two, it will be completely gone. The Chromexcel leather was a grand choice for the main body, as my little mishap proves that minor scratches and slivers can be buffed out through further use. A month into using the strop, I couldn’t be happier. I have taken it to barber shops all across Washington state and Idaho within the past few weeks and have received many compliments over what an amazing tool this is. There is one thing that I feel obliged to include, not because it’s particularly an issue, rather because I would feel somewhat guilty if I had not offered some sort of criticism in a review. When I pulled the strop out of the bag on the first day, I noticed that the stamp on the top of the main length was slightly crooked. I thought perhaps it was an optical illusion of some sort since it is ever so slight, but after utilizing a ruler, I found that the stamp was off ever so slightly. Does this effect anything concerning the function or durability of the strop? Certainly not! However, given the nature of this luxurious item, I feel obliged to include it within the review, but I want to ensure the reader knows that this does not alter my opinion on the quality of the product. Let’s talk pricing. First, this is a difficult thing to compare. There really are no other strops on the market aiming to compete with the quality of this strop. From my knowledge, save for a few long term, low-quantity artisans, there isn’t really a directly related strop to fairly compare this with. It would be like me trying to compare a McLaren with a Kia. Sure, both will get you places, but one will probably do it in style and efficiency, and I’m not talking about the Sportage! (Disclaimer: I own a Sportage…don’t you even dare give me a hard time) At $200, this strop is about twice as much as other strops in the market, but I will say that it is over twice the quality as well. The J. Ryan & Co. strop is for the discerning gentleman’s washroom, and for the professional barber who sees multiple heads a day. This is a strop for the person committed to wet-shaving or professional barbering who doesn’t want to have to buy another strop again, and who wants the absolute best quality product, which gives the absolute best quality results for their razors. You spent $400 on your favorite razor, so why wouldn’t you spend the money on a piece of practical art which will last the rest of your life? Don’t just pass down that razor collection of yours, pass down this J. Ryan & Co. strop as well. And remember, all strops are not created equal.